Architectural & Timberframe CAD software made easy. Using Wacom's Intuos L tablet archiTAB architectural is a fully automated CAD programme, producing elevations, sections and 3D models directly from the walls produced in plan. 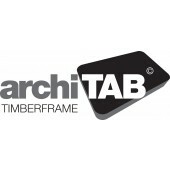 archiTAB Timberframe uses the same intuitive Intuos L tablet producing panel drawings at the required size directly from your plan drawing.